← 68. Braid Hills No 1. 16th Oct 2017. The junior of the two Moray courses is a fine example of links golf. Moray Golf Club is in Lossiemouth on the south shore of the Moray Firth, about 6 miles north of Elgin. The main course, Moray Old, designed by Old Tom Morris, opened in 1889 and is one of the great Scottish Links whose 18th hole has a magnificent green in front of the fine old clubhouse. The Moray New 18 hole course was designed by Sir Henry Cotton and opened in 1979, and extended the 9 hole “Ladies Relief” course which had been laid out in 1905. This is one of only 2 Scottish courses “re”-designed by Sir Henry (the other being Stirling). 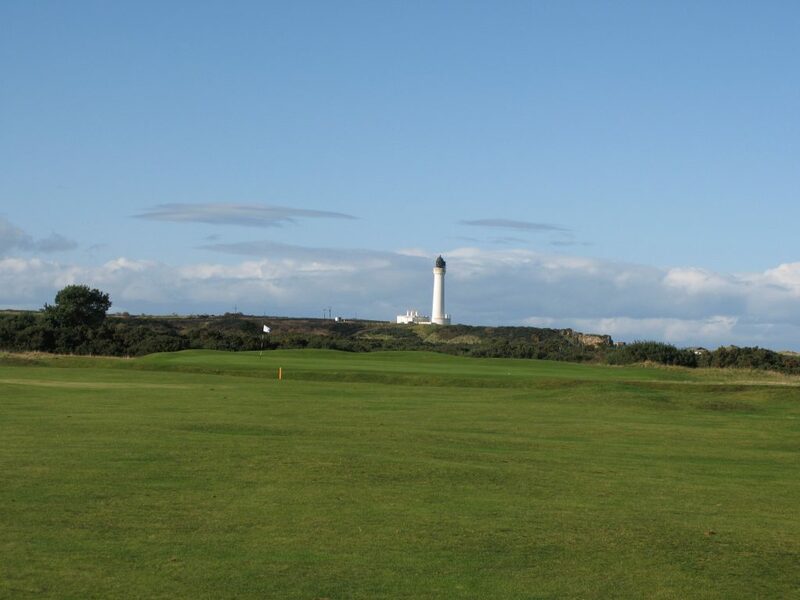 At just over 6000 yards, off the white tees, Moray New is still a substantial test of golf. With the wind blowing and the abundance of gorse, accuracy from the tee is very important here. The New course is closely intertwined with the Old and it’s important to check which coloured flags are in use on each course. 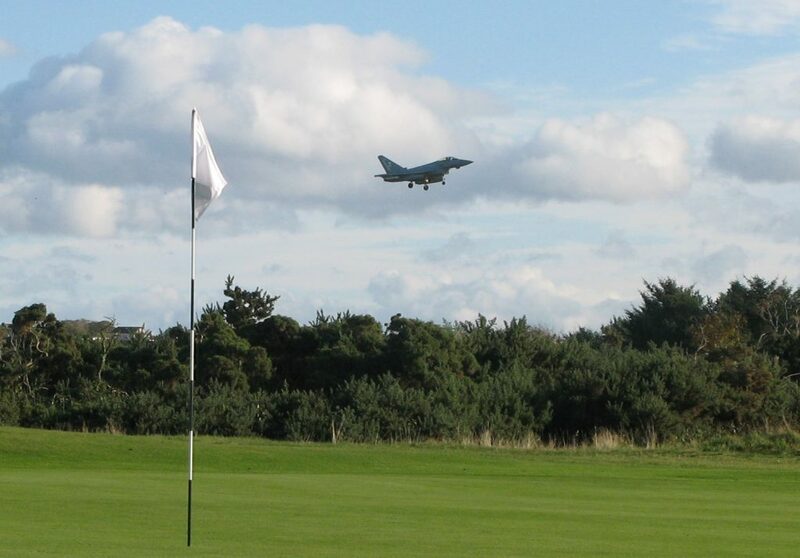 A significant hazard can be the noise from jet aircraft from the adjacent RAF Lossiemouth base, which is closest to the 6th green on the New. When I played there was a busy flying day and I was treated to some fast climbing displays by the local Typhoon jets of No’s 1(F), II(AC) and 6 squadrons – the primary task at RAF Lossiemouth is to maintain the Quick Reaction Alert (Interceptor) North mission. The course has some fine holes, dominated by the wind of the day. 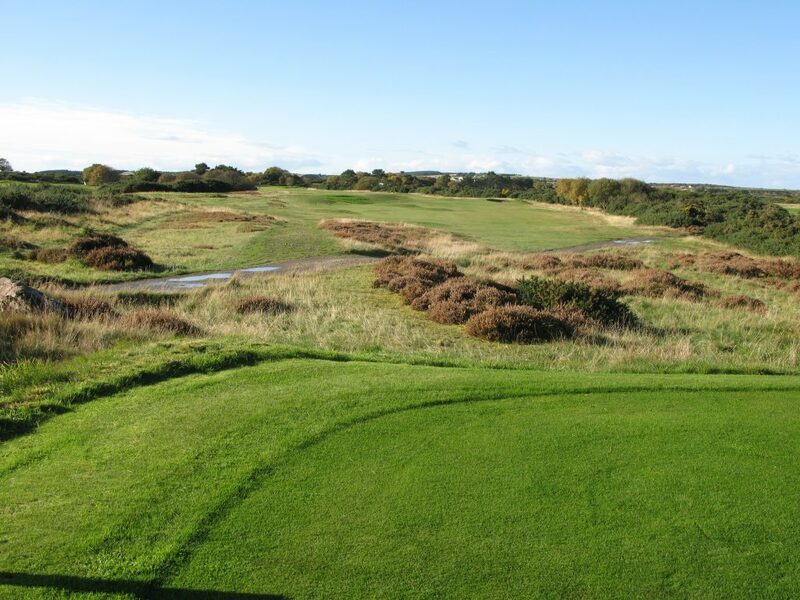 The 10th is the closest to the coast, and the prevailing wind will normally be against and from the left, making it difficult for a right handed slicer – the green is on a slight plateau and difficult to find. The par 4 14th, Stroke index 1, will play like a par 5 for all bar the really long hitters. There are some tricky par 3s, with the innocuous looking short 6th having the burn passing directly in front of the green, making a front tee position very difficult. The 17th, the longest of the par 3s, has 4 well placed green side bunkers awaiting. In general, there is some clever bunkering on both fairways and greens throughout the course, although this course does not have the deep re-vetted bunkers found on many a links course. 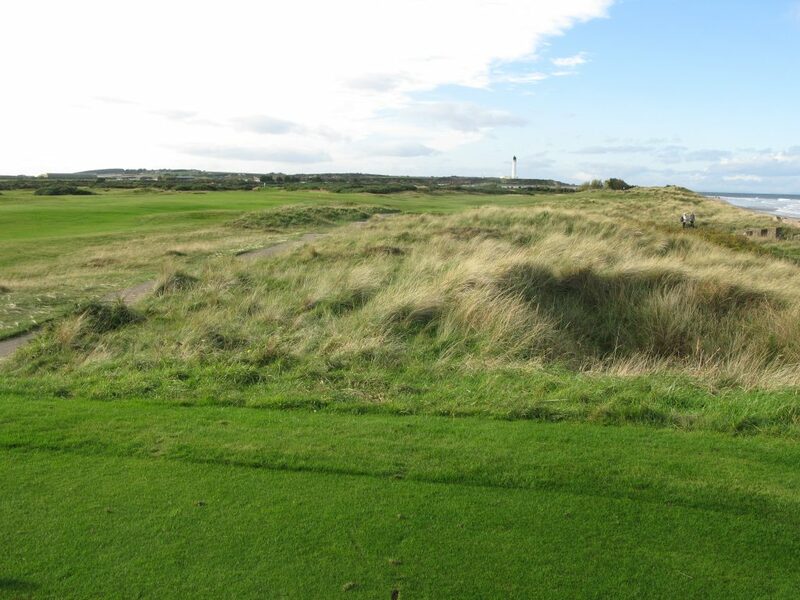 The course was in excellent condition for a late October day, demonstrating how accessible Scottish Links courses can be all year round – by comparison many courses inland were closed due to being waterlogged on the same day. Other than plane spotting, playing at Moray is highly recommended for whisky lovers, since Moray has a well established and long relationship with nearby distillers (several of whom were original members of Moray) from whom the club has bought several vintage whiskys. It has its own label “Club malt”, currently a Macallan. Curiously, there is more about the history of whisky on the club’s web site than the golf courses! Par 4 10th tee, a nightmare in the prevailing wind from the left! A story worth noting is the political dispute Moray GC had with, probably in hindsight, its most famous member, the first UK Labour Prime Minister, Ramsay MacDonald – he was removed from the membership list in 1916 for his opposition to the First World War. He was finally reinstated as a member in 1929, but never played Moray again. On the day, I played reasonably well for 28 points, although had a few disasters (on 12 and 14 especially), which meant I scored a gross 97. I got a birdie on 8, which was my highlight. If you plan to play the Old course at Moray, try and make sure you savour the New as well. Highly recommended. 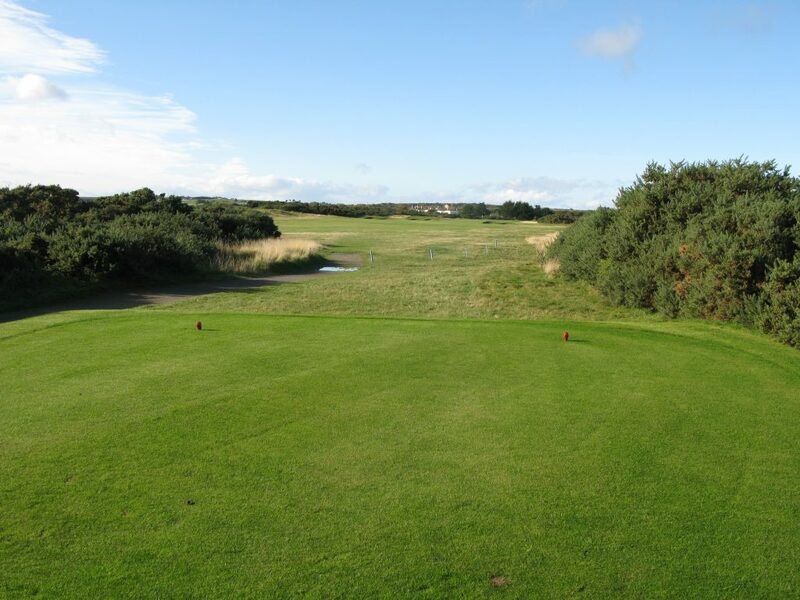 I played using The Courier golf voucher deal for only £15 – an absolute bargain. 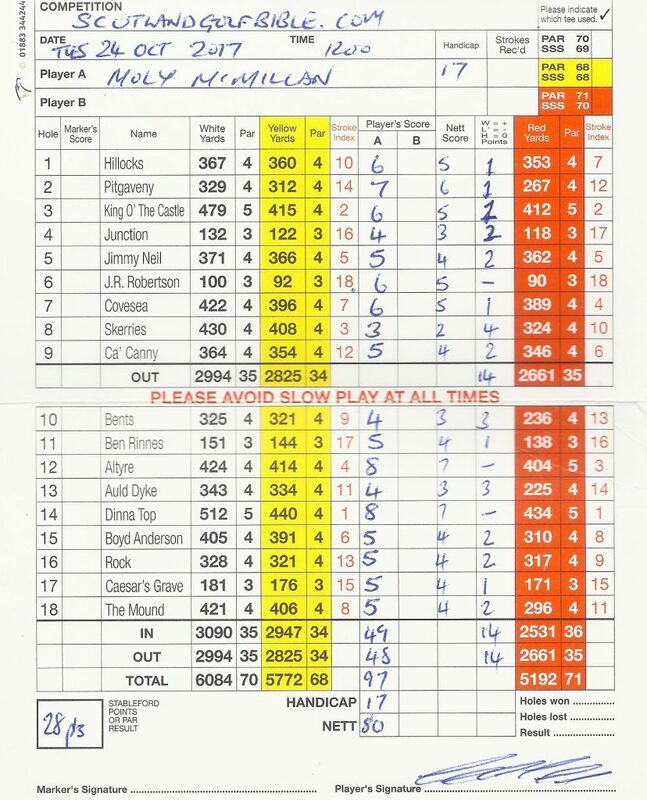 This entry was posted in 18 holes, 1901 - 1945, 4 star, 4 star, Course Architech, Course Owned By, Course Quality, Course Type, Henry Cotton, Holes, Links, Members, Overall Value, Price, Region, The Highlands, When Course Established, £40 - £59. Bookmark the permalink.